For many, a well-prepared plan is a must-have when starting a business – in fact, it is something our advisors heavily advise. But tradesperson Rick Coles needed a dynamic partner to throw the game plan out of the window. That’s where Gary Wheatstone from Business Connect came in. Rick wanted to develop a business that could allow him to ‘get off the tools’ and provide a solid income. He found a gap in the small affordable prefabricated housing market but needed help getting the idea off the ground. 'Gary drew out issues that anyone in my situation would be considering. He challenged me, gave me some homework and as the idea evolved and changed, Gary was always there,' Rick said of his acclaimed 'lifeline'. While researching he came across the idea of importing newly manufactured buildings from China and offering them as an economic alternative for homeowners looking to add extra accommodation for family members. Advisor Gary helped him fine-tune the offering. They discussed supplier choices, structural issues and transport logistics, local authority planning issues, establishing a process to track costs and subsequently establish a profitable selling price that fits favorably into the marketplace. 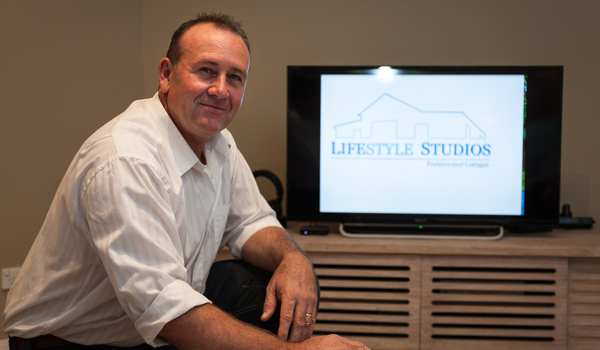 The first two studios have landed in Australia and getting ready to move soon. Stay tuned.